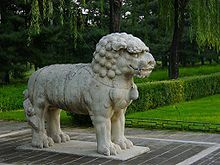 The Lion-Eating Poet in the Stone Den (simplified Chinese: 施氏食狮史; traditional Chinese: 施氏食獅史; pinyin: Shī Shì shí shī shǐ; Pe̍h-ōe-jī: si sī si̍t sai sú; literally: 'The Story of Mr. Shi Eating Lions') is a passage composed of 92 characters written in Classical Chinese by linguist and poet Yuen Ren Chao (1892–1982), in which every syllable has the sound shi when read in modern Mandarin Chinese, with only the tones differing. It is an example of a one-syllable article, a form of constrained writing possible in tonal languages such as Mandarin Chinese. Classical Chinese is a written language and is very different from spoken Chinese. Different words that have the same sound when spoken aloud will have different written forms, comparable to air and heir in English. Many characters in the passage had distinct sounds in Middle Chinese. All of the variants of spoken Chinese have, over time, merged and split different sounds. For example, when the same passage is read in Cantonese (even modern Cantonese) there are seven distinct syllables—ci, sai, sap, sat, sek, si, sik—in six distinct tone contours, producing 22 distinct character pronunciations. In Southern Min or Taiwanese Hokkien, there are six distinct syllables—se, si, su, sek, sip, sit—in seven distinct tone contours, producing fifteen character pronunciations. Therefore, the passage is barely comprehensible when read aloud in modern Mandarin without context, but easier to understand when read in other Sinitic languages, such as Cantonese. Forsyth, Mark. (2011). The etymologicon : a circular stroll through the hidden connections of the English language. London: Icon Books. ISBN 978-1-84831-307-1. The Three "NOTs" of Hanyu Pinyin has a similar but different text, and it explains that Yuen Ren Chao's intention was not to oppose Chinese Romanization. This page was last edited on 16 March 2019, at 09:52 (UTC).